Bask in the sun and enjoy the cool breezes, enjoy a stroll on the beautiful white beaches, and share the golden sunsets! 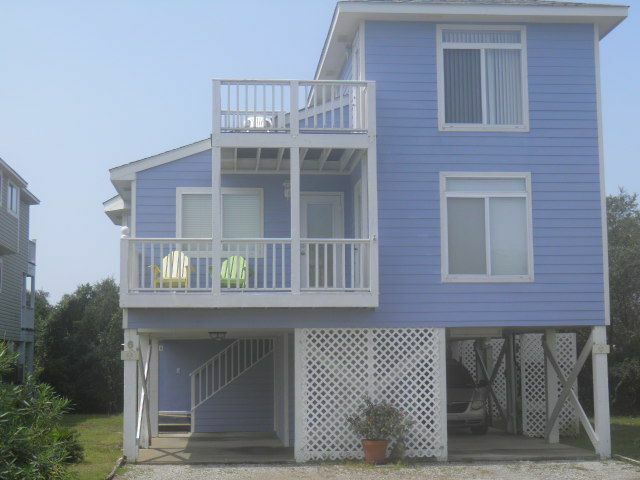 Southern Delight Duplex is located in family-friendly Gulf Shores Plantation - a secure, gated Gulf Front Resort. The Robert Trent Jones Kiva Dunes Golf Course is directly behind this unit. The cottage is directly across from tropical courtyard with 2 outdoor pools, a hot tub gazebo, pool cabana, and a short boardwalk to the sugar white sandy beaches!! Bring the whole family! Each unit has 3 bedrooms and 2 bathrooms plus spacious living area and fully furnished kitchen with new full-size appliances. Main floor has living area, kitchen, and downstairs master bedroom with connecting bath and king-size bed. Upstairs is another Master bedroom with connecting bath and King-size bed plus 3rd bedroom with bunk beds. All rooms professionally decorated with beach décor. 4 Sets of towels provided in each bathroom. Rent the Whole Cottage! Need more room - rent both sides and have 6 bedrooms, 4 bathrooms, 2 living areas and 2 back-to-back kitchens with connecting doors between kitchens and upstairs halls. Unit A is vrbo listing 492601. Play some Tennis, Basketball, Volleyball, and Horseshoes! Beach Chairs and provided in guest storage. Owners are Larry and Peggy Adams. Larry was professor at a north Alabama University. Peggy is a retired rocket scientist. We both love the beach! You can stay connected free wifi upgraded to new service in Oct 2014. Enjoy all the resort amenities and ocean breezes. Play golf at Kiva Dunes. Don't feel like cooking - visit on-site Sassy Bass Snack Bar or Kiva Dunes Bar and Grill. Kiva Dunes serves breakfast, lunch, early dinner, and drinks. This home had everything we needed for an awesome week at Gulf Shores! We love the quiet location out on the peninsula, and though we couldn't see the water, it was a very short walk past the pool to the boardwalk and the sand. The kitchen was very well equipped, and the beds were comfortable. There are TVs in every bedroom as well as the living room which made for good alone time when traveling with others. The house was spotless, and new furniture arrived during our stay as well. We will be back! Great location. Close to pools, beach, hotel restaurant. Everything in walking distance. Washer and dryer were extremely handy in the main level bathroom. Within 30 minutes of kayaking, boat rentals and anything you need for beach fishing! We hadn’t originally planned on coming to Gulf Shores, but now we plan on coming back again soon! The only negative was not much of a view from Unit B. Southern Delight 6B had all the amenities and comfort that made our vacation week very enjoyable. What a great getaway for the week. We thoroughly enjoyed our stay. To be quite honest, we didn't want to leave. Pools were very close and the beach wasn't very far either. The cottage itself was very nice. Thank you very letting stay!!! A great quiet place for families! It was a nice comfortable stay for 4 adults and three kiddos! Mrs. Adams was quick to respond to emails and very accommodating with special requests! Thank you for sharing ur home with us! If we end up in the area again we will definitely choose this place! Rates are subject to change until reservation is confirmed. A 25 percent premium may apply to holiday weekends.